When asked by CNET if it stores location information on users' phones, Microsoft promptly responded with specifics about how it does so minimally and securely. The Redmond, Wash.-based company said only user-allowed, location-based apps collect location data from its phones. Those apps' data isn't stored on the phone itself, though, and so can't be hacked by third parties or synced back to the company. Of course this data is stored somewhere, but only when "the application or user makes a request for location information," the company said. In technical terms, Microsoft's mobile OS will transmit a Windows Phone device's unique identification number, along with the phone's signal strength, a randomly generated device ID, and GPS coordinates, but only if someone decides to run a location-based app. This information is all encrypted, according to Microsoft. This differs from Apple's practice of recording the locations of iPhone and iPad devices in an unencrypted file on the device, which can result in more than a year's worth of data being quietly logged, according to two researchers who recently discovered the feature in Apple mobile devices. Google's Android devices collect tracking data, but records only the last few dozen locations. These practices have resulted in a firestorm of outcry, with senators and House representatives, consumers, and even international governments demanding answers to sensitive questions on what the data is being used for and why it is being gathered in the first place. Apple is now being sued for violating Fourth Amendment rights as well. Microsoft's quick, pro-active response contrasts to Apple and Google's relative silence upon being asked similar questions about their tracking policies this week. Google recently responded to the Wall Street Journal to questions, insisting however that the data is anonymized without going into detail about exactly how. But Apple has stayed officially silent on the matter. The software company's relative openness about its data gathering practices may cast it in a favorable light as attention only intensifies, especially as members of Congress begin to scrutinize privacy issues and demand answers not just from Apple and Google, but other mobile companies. This, along with burgeoning governmental concerns about data and privacy in general, only means that the question will not go away. Microsoft's response may be its way of opening a conversation on its own terms, and highlights its relative security when it comes to location data collection. The company could use this good PR about now, as they trail behind competitors Apple and Google. It trails these two companies in a distant third in sales in the smartphone market. 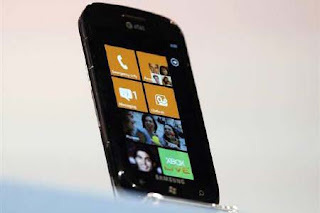 It may be too much to hope Microsoft's relative respect for consumer privacy will boost Windows 7 Phone sales greatly, but the company can perhaps claim some high ground in what continues to be a controversial matter.